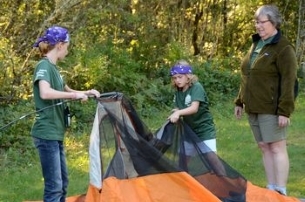 In WOW’s 17th year, the ‘2014 Partnering Workshop’ was an inaugural event: a first in which mothers, grandmothers, female relatives and family friends could pair with 8-13 year old girls to promote and further outdoor family traditions. WOW’s vision was to mentor our younger generation and ignite an excitement for the outdoors by helping them gain confidence through hands-on experiences in informative, relevant and reassuring class settings. The goal to this end was to invite mothers and daughters to enjoy connecting with the outdoors and each other by attending this weekend outdoor skills workshop. Casting a fly on the river, cooking in Dutch Ovens, orienteering together through a course after map and compass instruction; discovering and understanding the wildlife signs on a spiked trail, making healing salves from our local plants, making survival shelters in the woods, shooting targets in archery, and learning about the why’s and how’s of hunting….are just some of the experiences WOW offered as we motivated participants to include wilderness and wildlife in their lives. WOW’s hands-on experiential education meant survival shelters needed to be constructed, tents erected, make-believe wounds cleaned and bandaged, and knots tied – by hand ! These girls learned by doing and that sense of empowerment is priceless. We’d hear our motto throughout the weekend: “I did it. We did it!” To get young people to root a real love of the outdoors into their lives, to offset the distractions of the digital world…can yield valuable dividends: for their personal recreational opportunities and for support of conservation and wildlife issues in the future. These workshop participants were a delight to teach! They were enthusiastically energetic in their approach to new skills; had very good with hand-eye coordination, and were great fun to watch as they experienced new accomplishments with new friends! 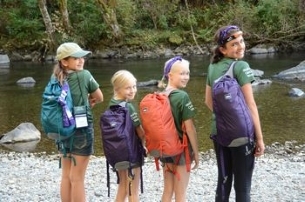 Special thanks to The Rocky Mountain Elk Foundation (RMEF) and to REI, Inc. for their incredible support of the 2014 WOW program: RMEF, for their generous scholarship funding and REI for their donation of backpacks and headlamps to make the girls’ workshop experience even more memorable! 6th Annual WOW Waterfowling March 19th, 2016.